The formation of the Group of Six helped to draw the bonds of friendship closer between us. For two years we met regularly at my place every Saturday evening. Paul Morand would make the cocktails, and then we would go to a little restaurant at the top of the Rue Blanche. The dining room of the Petit Bessonneau was so diminutive that the Saturday customers filled it completely. They gave free rein to their high spirits. We were not all composers, for our numbers also included performers: Marcelle Meyer, Juliette Meerovitch, Andrée Vaurabourg, Irène Lagut, Valentine Gross, Jean Hugos fiancée, Guy Pierre Fauconnet; and writers: Lucien Daudet, Raymond Radiguet, a young poet who was brought to us by Cocteau. After dinner, lured by the steam-driven roundabouts, the mysterious booths, the Daughter of Mars, the shooting galleries, the games of chance, the menageries, the din of the mechanical organs with their perforated rolls seeming to grind out simultaneously and implacably all the blaring tunes from the music halls and revues, we would visit the Fair of Montmartre, or occasionally the Cirque Médrano, to see the Fratellinis in their sketches, so steeped in poetry and imagination that they were worthy of the Commedia dellArte. We finished up the evening at my house. The poets would read their poems, and we would play our latest compositions. Some of them, such as Aurics Adieu New York, Poulencs Cocardes and my Boeuf sur le toit were continually being played. We even used to insist on Poulencs playing Cocardes every Saturday evening: he did so most readily. Out of these meetings, over which a spirit of carefree gaiety reigned, many a fruitful collaboration was to be born; they also determined the character of several works strongly marked by the influence of the Music Hall. The evenings would end at Darius Milhauds or at the Gaya bar, where they listened to Jean Wiéner play black music. Cocteau would read his latest poems. Milhaud and Auric, joined by Artur Rubinstein, played Le Boeuf sur le Toit six hands. This work, mounted in 1920 at the Théâtre [sic] des Champs-Élysées with the famous Fratellini, would become the hit of the Saturday partiesso much so that the owner of the famous Gaya bar gave his new restaurant on the rue Boissy dAnglas the name Le Boeuf sur le Toit. Jean Wiéner and Clément Doucet did the rest to make this address a fashionable meeting place. According to Maurice Sachs in Au Temps du Boeuf sur le Toithis mock-journal of the years 1919 through 1929, published in 1939 (Nouvelle Revue Critique)Gaya moved to 28 rue Boissy dAnglas (see photos of the new establishment) on 15 December 1921 and was renamed Le Boeuf sur le Toit because its manager, Louis Moysès, believed that Cocteau would bring him luck. The bar quickly became one of the most fashionable nightspots in Paris and remained so through the late 20s, until Moysès was forced to move it to several successive locations. The restaurant exists to this day, but with no trace of its former bohemian effervescence and social cachet. 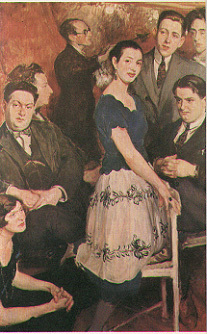 An account of its changing fortunes is given in Les dîners du samedi, 19181920 by Marie-Christine Movilliat. So popular was Le Boeuf sur le Toit in its heyday that Maurice Sachs wrote in 1928: [...] other justly famous restaurants whose names are still remembered by all or that are still in open and will remain so for a long time seem to have existed only before or after the old Boeuf. The name was adopted by restaurants and cabarets in various French and Belgian cities. 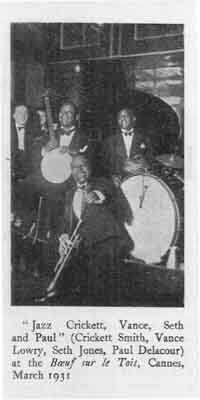 Jazz musicians who played in other Parisian venues gathered at Le Boeuf sur le Toit to jam after they had finished their paying gigs. To this day, jam sessions in France are called Boeuf, and jamming is faire le Boeuf or taper le Boeuf. Le Boeuf sur le Toit achieved such legendary status that it ended up becoming a symbol for Paris in the 1920s and led to the common misconception that Milhauds rondo had been named after the bistro rather than the other way around. 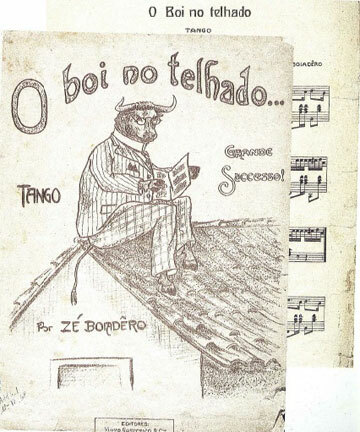 The tango O Boi no Telhado (The Ox on the Roof) by José Monteiro, aka Zé Boiadêro, was launched at the 1918 carnaval and rarely heard of since. By now its so thoroughly forgotten that only a handful of people would be able to recognize its melody. The songs claim to fame is so intrinsically tied to Milhauds piece that most listeners who know of it automatically assume that O Boi no Telhado is the recurring rondo theme in Le Boeuf sur le Toit. In fact, the tangos section A appears just once, at 2:19 min. into Louis de Froments recording, played by the brass in counterpoint with O Matuto in the strings. Listen to an excerpt from this recording. 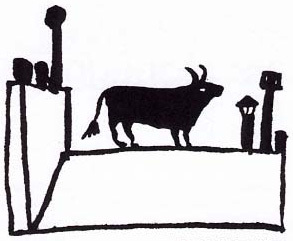 The motif of a cow on the roof is a universal one and appears in Chinese, Welsh, and Norwegian tales, American rural and urban folklore, and countless restaurants around the world. Had the melody of O Boi no Telhado been as endearing as its title, perhaps we might still be singing it today.